The development and application of genome-editing proteins to study biology and to treat genetic diseases. The life sciences are experiencing a revolution driven by the development of modern genome editing agents. 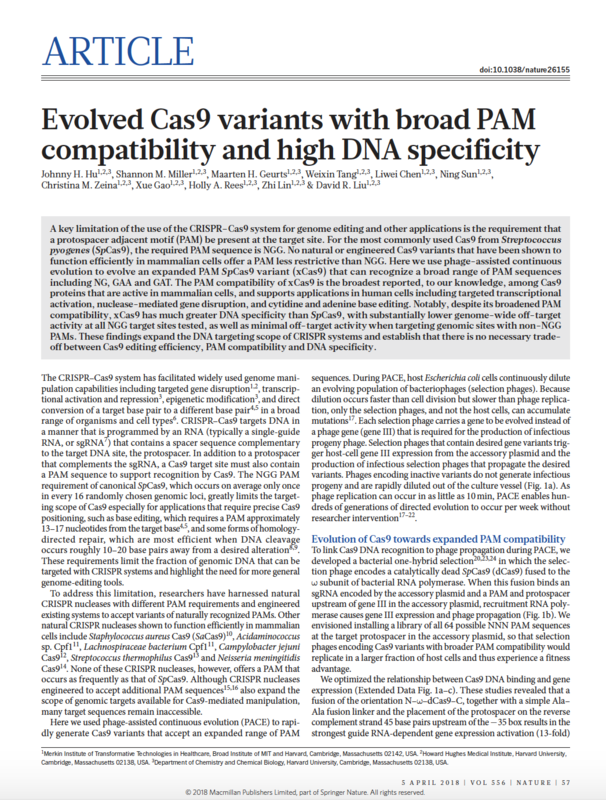 These agents include RNA-guided programmable nucleases from CRISPR systems, which generate precise breaks in DNA or RNA at specified positions. 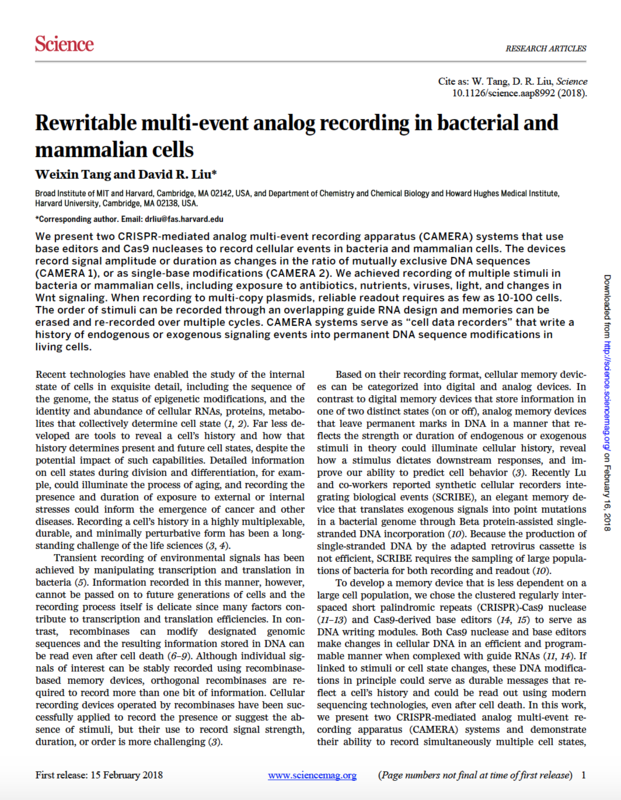 In cells, this activity can lead to changes in DNA sequence or RNA transcript abundance. 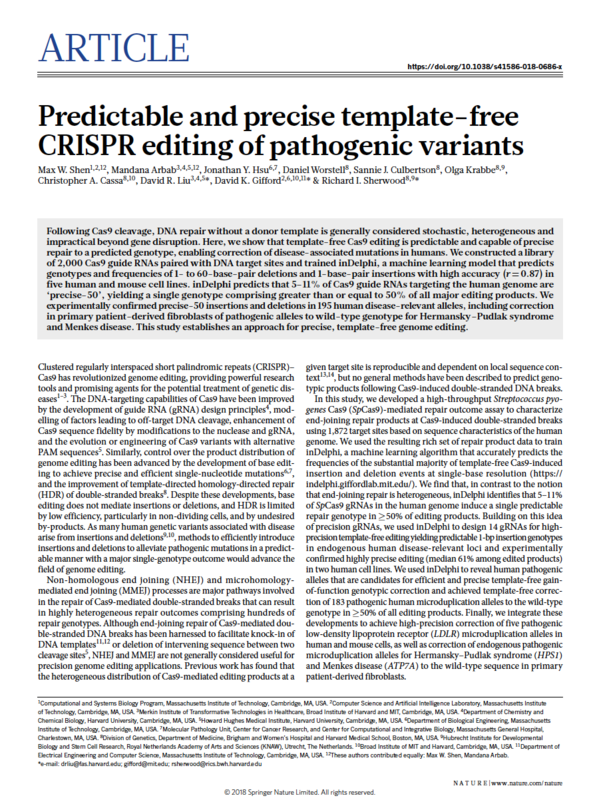 Base editing is a newer genome editing approach that uses components from CRISPR systems together with other enzymes to directly install point mutations without making double-stranded DNA breaks (DSBs). 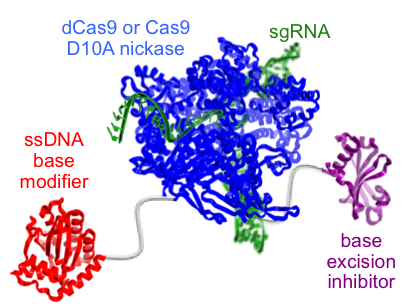 Base editors comprise a catalytically disabled nuclease fused to a nucleobase deaminase enzyme and, in some cases, a DNA glycosylase inhibitor. Base editors directly convert one base or base pair into another, enabling the efficient installation of point mutations in non-dividing cells without generating excess undesired editing byproducts. The two classes of base editors (adenine base editors or ABEs and cytosine base editors or CBEs) developed by the Liu group can correct all four transition mutations, which collectively account for more than 60% of human pathogenic point mutations. 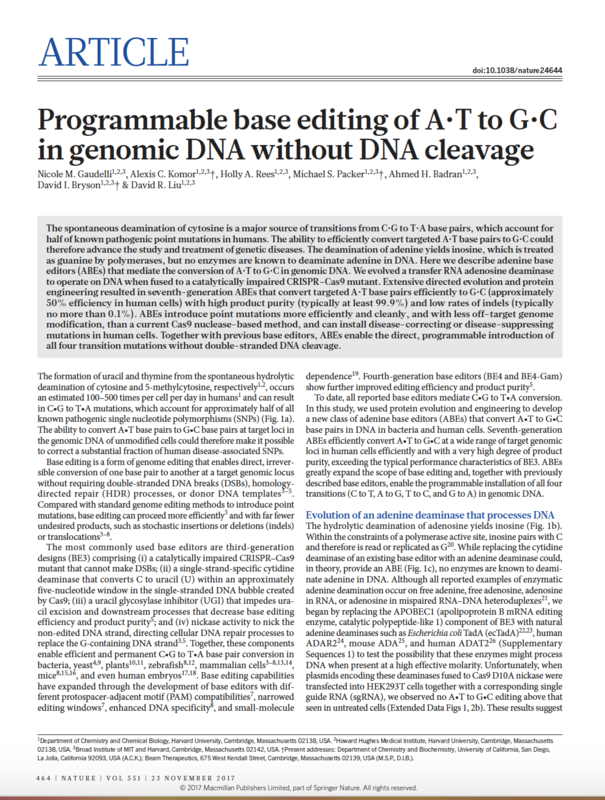 These base editors have been distributed by Addgene to thousands of researchers around the world. Their use in a variety of species including prokaryotes, fungi, plants, insects, and mammals to install or correct point mutations, including those that drive genetic disease, has resulted in more than 100 publications. In addition to enabling precise point mutation with fewer byproducts using base editing, our group has also advanced our ability to address other major challenges facing genome editing, including improving the DNA specificity of editing agents, improving their targeting scope, and enabling their delivery in vivo to tissues of therapeutic relevance. We have integrated and applied these advances to treat animal models of human genetic diseases. Video Description: Base editing is a novel approach, developed in the Liu lab, that directly converts a target base pair to another base pair, without inducing double-stranded DNA cleavage. 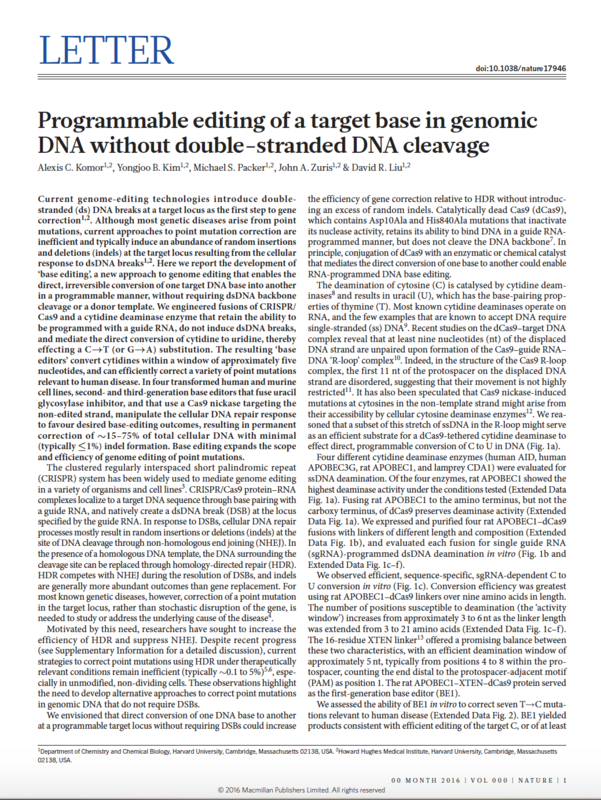 By circumventing the need to induce a DNA break, these base editors boast a more precise mechanism of action than traditional genome editing agents. 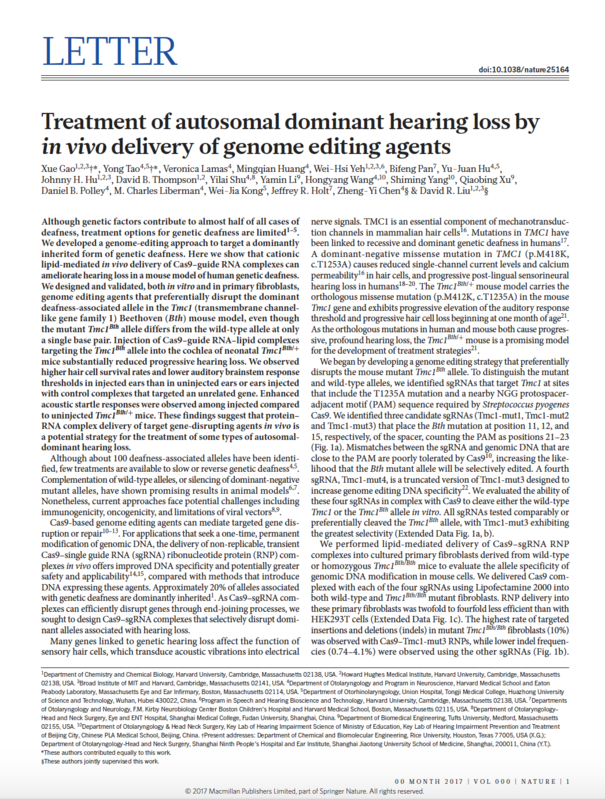 Furthermore, these editors have tremendous therapeutic applications for human genetic diseases.